Greetings, loyal readers! 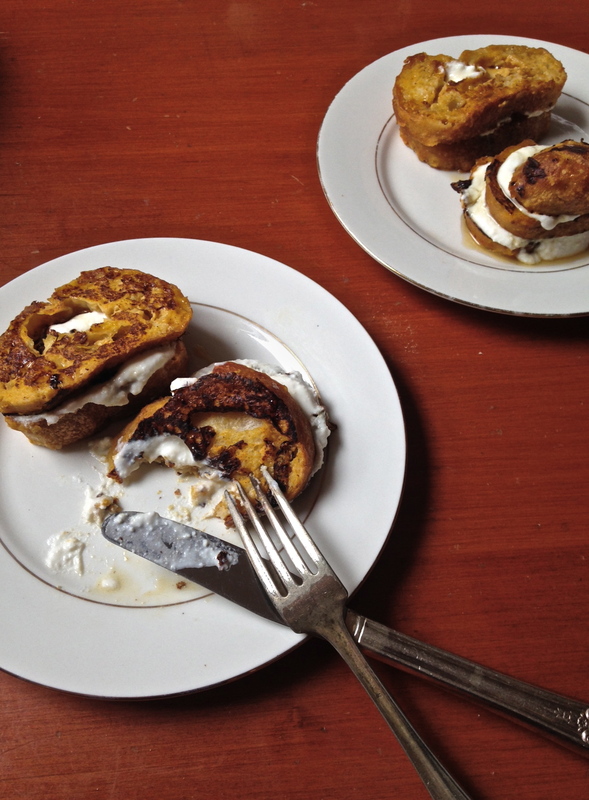 I know what you’re probably thinking after reading that title: french toast-wich? But bear with me, because when you make these, the question you’ll be asking yourself is which wich do I eat because they all look so tasty. The answer is all of them. Because you can and they’re delicious. Okay, that might be a little dramatic. So how about eating half? I did! And I’m not even that into pumpkin. Speaking of pumpkin, and “wiches” (Badum chh), how was everyone’s Halloween? I didn’t really celebrate this year, because I was sick and I had rehearsals all day. Anyway, back to the magical bites of wonder… I mean how can you resist those adorable little slices and that creamy ricotta? My mouth is literally watering as I write this. Sorry, that’s a little gross. But it’s true! And save for a drizzle of maple syrup, these indulgent little guys are pretty healthy. They don’t contain any refined sugar, but they taste fantastic; subtly sweet and pumpkin-y with a smooth ricotta filling. They have a healthy punch of protein thanks to egg in the batter and greek yogurt mixed into the ricotta, which is also fat free, so you can indulge without fearing the consequences later. 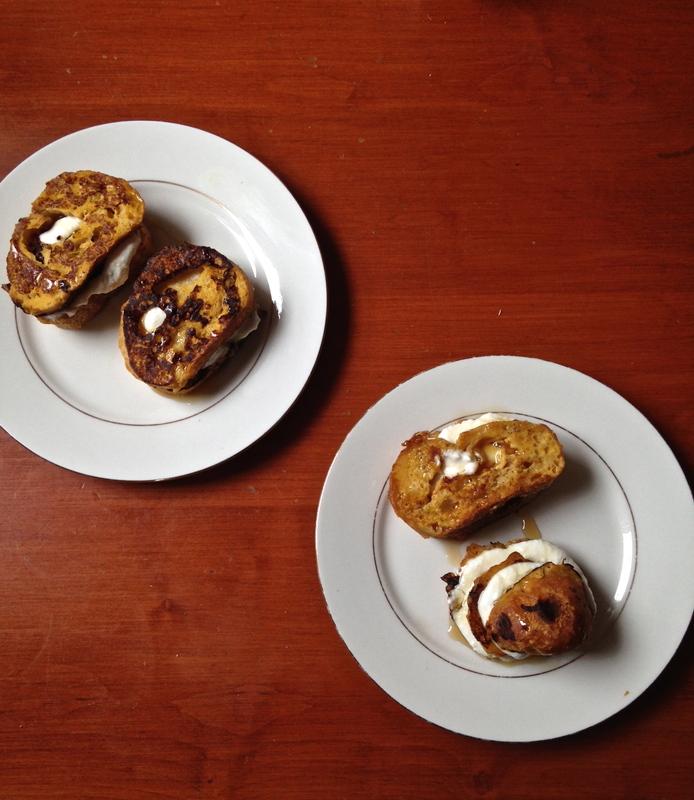 These are fast and easy to whip up, perfect for a weekday breakfast or a weekend brunch. Enjoy! Note: For a fancier occasion, try adding fresh berries to the filling or sprinkling a few on top for added flavor and presentation. 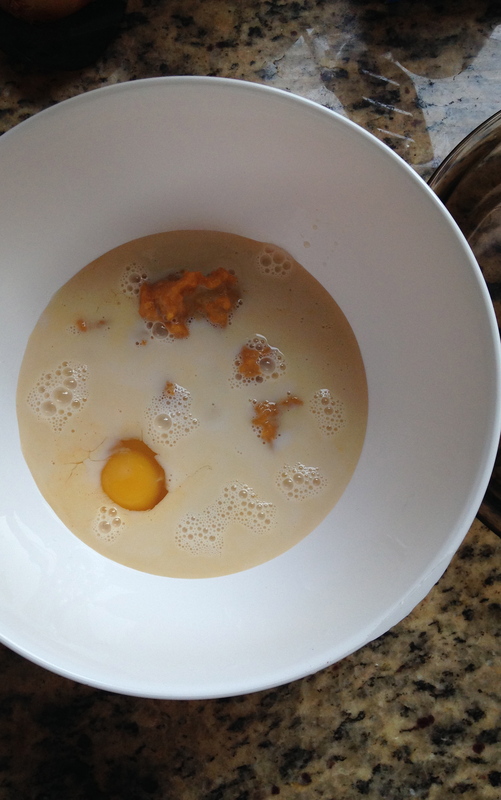 In a medium sized bowl, combine almond milk, egg, and pumpkin and whisk until thoroughly combined.Sprinkle in the spices and vanilla extract and continue whisking until smooth and homogeneous. 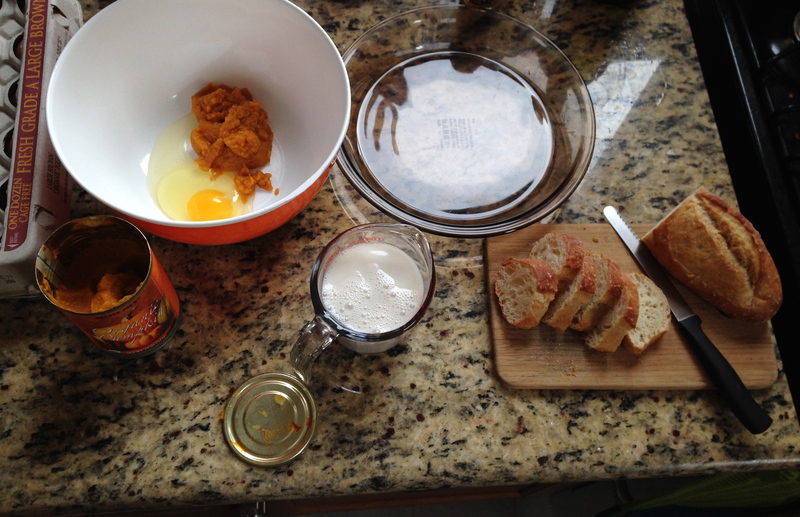 Pour the batter into a large shallow dish and set aside. Slice the baguette into about 16 1 or 2 inch slices. In a small bowl, combine the ricotta and greek yogurt and mix with a spoon until smooth. Set aside. Place a nonstick pan on a burner over medium heat. Depending on the size of your pan, you can probably cook between two and four slices at one time. Place however many slices of the baguette in the batter and allow to soak for about 3o seconds on each side. Place battered slices in the pan. Cook for 1-2 minutes on each side until golden and cooked through. Repeat with the rest of the slices. To make the sandwiches, spread the ricotta mixture thickly on one side of a slice and press another slice on top, repeating until all the bread has been used. Plate and drizzle with maple syrup. Serve.